Read 2 Timothy 1 at Bible Gateway. 2a) 2 Tim 1:15-18, Faithlessness those in Asia who have turned away from Paul. Not fear, but faith. 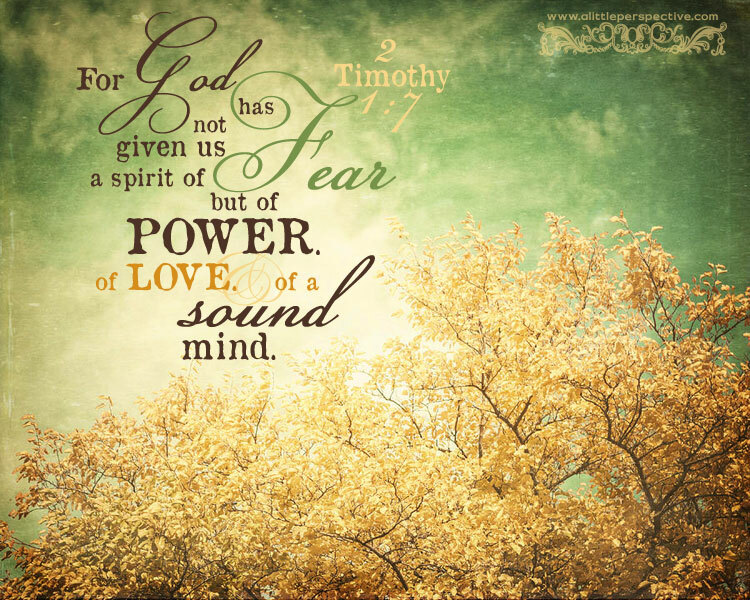 Fear does not come from God, it is an enemy, a weapon of the evil one to paralyze us and cripple us from moving forward or acting on what God is calling us to do. It doesn’t matter if the fear is of lack of provision, personal harm, mistreatment, or any other issue — God is our Father, our Nourisher, Protector, and the Uplifter of our head. He is our Advocate, Comforter, Edifier and Encourager, who loves us with the greatest Self- sacrificial love in the Universe. Whatever fear goes through our minds, we need to realize its source and purpose. The spirit of fear is from the enemy, who is a liar and the father of lies (Joh 8:44), whose purpose in every lie, including fear, which comes from his mouth, is to steal, kill, and destroy (Joh 10:10). Listening to fear is the same as agreeing with it, that it is true … which it is not. Listening to fear weakens the mind and shakens our mental stability. Fear sows doubt in our hearts and minds, so that we question whether God really loves us. He does love us, and knowing the depth of His perfect love (Rom 8:38-39, Eph 3:17-19) drives fear far away (1 Joh 4:18). We have faith, not fear, because we know Him: we know the faithfulness and the depth of love of Him who is the Creator and King of the Universe. Paul had some bad things happen to him. Back in Corinthians he told of some of the persecution he had received at the hands of the unbelievers, for his uncompromising preaching of the gospel. Paul was ultimately beheaded for his faith. This is not proof that God did not love him or was not faithful to him. Just the opposite; every person, once they have received salvation through Jesus Christ by faith, now has eternal life hidden with Christ in God (Col 3:3); their future is secure. They remain on this earth to witness of the truth they have now experienced. The enemy’s opposition to that witness does not mean lack of love on God’s part. We don’t know the effect our faithfulness through suffering will have as a witness to others. At any rate, no matter what happens to our life in this natural plane of existence, nothing is able to change the fact of our eternal life secure with God. If we experienced suffering here, we will experience reward there. And God has not left us defenseless, but our ultimate enemy is not whoever is persecuting us today, but principalities, powers, and rulers of wickedness in heavenly places (Eph 6:12) … which God has given Jesus authority over, and then seated His body (you and me) with Him in heavenly places, far above them (Eph 1:17-23). So faith is a reasonable, sound, and logical response in the face of fear and difficult circumstances and people. 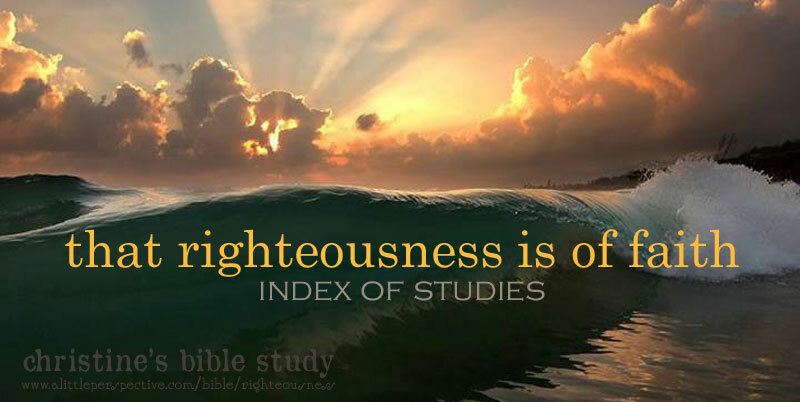 That righteousness (right- standing, salvation, or justification) is obtained by grace through faith and not by works of obedience to the Law. The purpose of the Law, which has not passed away.